Brownies have always been a favourite treat of mine and I have attempted to make them on my own, but for some reason, they never turn out that good. I have to say that after sampling Fairytale Brownies, I won’t be bothering to make any since they can never compare to the amazing chocolately deliciousness (is that even a word?) of Fairytale Brownies! These brownies ROCK! I tried them once before back in March and have been dreaming about them since. Let me tell you I was doing jumps of joy when I found out that I would be doing another review for them for my Valentine’s Day Event. Fairytale Brownies are all-natural and are free of trans fats, hydrogenated oils, preservatives and artificial colours. They are also guaranteed fresh on arrival and can be easily stored in the fridge as long as you eat them within one week or you can freeze them if you want to keep them longer. Yes, they really do arrive fresh at your door. Their shipping is super fast even to me in the middle of nowhere, Nova Scotia, Canada! Fairytale Brownies sent me on of their Valentine’s Day treats to try- The Valentine Morsel 24. 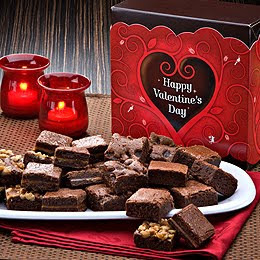 They include 2 dozen of the bite size brownies in 6 of the following flavours: Original, Caramel, Chocolate Chip and Walnut all packaged in their classic box with a Valentine gift band. I couldn’t wait to dig in and did so even before Fedex had left my driveway!! Again, I cannot stress how AWESOME these brownies are. They are the best brownies EVER! All the flavours were wonderful and so sinfully sweet. They just melt in your mouth. I am partial to the Caramel while John devoured the Chocolate Chip. Fairytale Brownies would make any chocolate lovers day to receive as a Valentine’s Day gift. They are a special price right now at $26.90. Fairytale Brownies are huge hit in our home and we would definitely purchase them either as a gift for someone or as treat to indulge in ourselves.